Although many parts of the body help make red blood cells, most of the work is done in the bone marrow. Bone marrow is the soft tissue in the center of bones that helps form all blood cells. Healthy red blood cells last between 90 and 120 days. Parts of your body then remove old blood cells. A hormone called erythropoietin (epo) made in your kidneys signals your bone marrow to make more red blood cells. Hemoglobin is the oxygen-carrying protein inside red blood cells. It gives red blood cells their color. People with anemia do not have enough hemoglobin. Some types of anemia may cause other findings on a physical exam. · Blood levels of iron, vitamin B12, folic acid, and other vitamins and minerals. 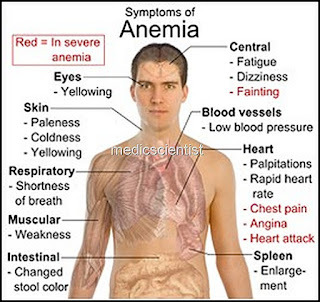 Other tests may be done to find medical problems that can cause anemia. Severe anemia can cause low oxygen levels in vital organs such as the heart, and can lead to a heart attack. Symptomatic Homeopathy medicines helps for அனீமியா Anaemia , It helps to prevent further recurrence also. So its good to consult a experienced Homeopathy physician without any hesitation. For appointment please Call us or Mail Us.